I always like to hear about the achievements of chemical engineering students around the world. IChemE has a long history of recognising such achievements and its a great way of encouraging and nurturing future talent. The Macnab Lacey Prize was created when the McNab Medal for the best student design project and the Lacey Prize for environmental thinking were merged in 2011. It is open to final-year students from all IChemE-accredited universities, rewarding the project that best contributes to a sustainable world. I am pleased to report that a student team from Monash University in Melbourne, Australia, has won this year’s MacNab Lacey Prize. And they must be doing something right at Monash, because their undergraduates have grabbed the Prize two years running. Monash University’s winning entry was a conceptual design that determines the feasibility of using black liquor (a lignin rich co-product of wood pulp produced in paper production) as a renewable feed-stock for ammonia production. The judges, made up of experts from IChemE’s Sustainability Special Interest Group, had the task of reviewing entries from Australia, Malaysia, Singapore and the UK. They were looking for clear evidence of the sound application of fundamental chemical engineering principles and full consideration of sustainable process design. Other considerations, including the social and economic impacts of the project also had to be clearly identified. The Monash University team was unanimously selected as the winner by the judges, with entries from the University of Manchester, UK and Imperial College London, UK highly commended. 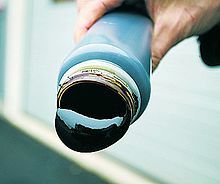 Usually, black liquor is burned in a boiler to recover inorganic pulping agents and to generate steam. In Monash’s alternative gasification process, a hydrogen-rich syngas steam is produced. At the same time, inorganic pulping agents are recovered and recycled for use in the paper mill. The manipulation of this syngas steam provides feedstock for ammonia synthesis, with excess product available to generate electricity in a gas turbine – ultimately reducing the imported electricity requirement of the mill. The ammonia can then be fed to an adjacent fertiliser plant, and the fertiliser used to enhance biomass production for the pulp mill. The project analysed the environmental, economic and social impacts of the concept and concluded that it was a feasible route to “green” ammonia, with the significant advantage of the symbiotic relationship between the various production facilities. The winning team, supervised by Prof Gil Garnier, comprises Richard Arthur, Jimmy Nguyen, Trang Truong, Kirilly Wagstaff, Daniel Wielechowski and Makarios Wong. My successor, IChemE deputy president, Dr. Andrew Jamieson presented the team with a cash prize of £750, and was keen to offer words of encouragement to all involved. Andrew also tells me that the success of their design project helped some of the students involved to secure graduate positions in the pulp and paper industry. IChemE’s international accreditation process embeds sustainable thinking as a key learning outcome from undergraduate degree programmes. The design of more sustainable processes and products is a competency that the professional chemical engineer will go on to apply throughout their career. Today, sustainable chemical engineering matters more than ever before. This year’s MacNab Lacey prize winners have set a great example. If you have an undergraduate design project that you are proud of, please get in touch and I’ll make sure that it is drawn to the attention of next year’s judges. Hopefully this prize will raise the standard of student design projects.